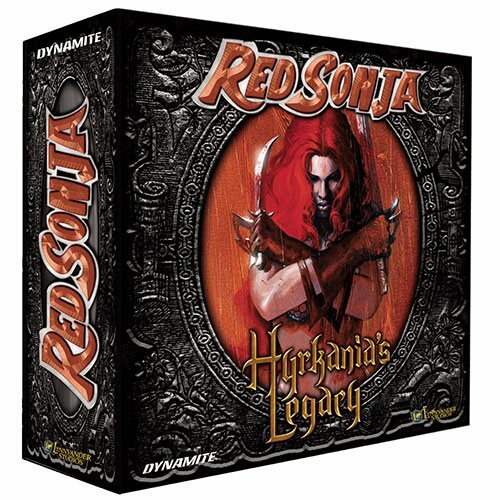 Red Sonja: Hyrkania's Legacy is a cooperative, modular-adventure board game for 1-4 players, expandable to 6. The game allows players to participate as one of their favorite Red Sonja Comic Book characters ranging from the Barbarian Osin, the famous Red Sonja herself. These heroes will champion all that is the Hyborian good in 90 minutes as the players travel across the realm of Hyrkania and face dangerous warriors, mythical beasts and the walking souls that haunt the lands. Collect lore-enriched relics, artifacts, weapons and special awards under a heated deadline while re-telling some of Red Sonja's best adventures in comic book and open source fictions history! This game will challenge you and excite you. Everything you need is provided at the gaming table, just bring your friends, your love of Red Sonja (knowledge of Red Sonja lore optional), and your thirst for adventure! Onward to a world of high adventure!